Department of Automotive Engineering (DAE) is an active member of Automobile Transport Engineering Science which fosters traditions and values in this area; Department aims to contribute to development process of advancements in our country. The possibilities created here range from Innovative Engineering Solutions, Idea-Generation to Project implementation and international collaboration. To ensure the processes of scientific activities and studies, our scientists and researchers work with a unique laboratory equipment and computer-modelling programmes, which are used for specific research, experiments and provision of services to Business entities. Annually strenghtened laboratory base allows to maintain an intensive, high level scientific research and study process. One of the most intensive research directions at Department of Automotive Engieering (DAE) are Investigation of Internal Combustion Engines (ICE) which are aimed at improving ecological and economic parameters. DAE successfully continues collaboration with the world's largest independent research and development company in Austria, „AVL List GmbH“. In accordance with the special AVL-University partnership (University Partnership Program), our researchers are entitled to use one of the most advanced ICE Simulation Software. AVL BOOST Simulation Software provides opportunities to simulate ICE parameters, structural changes and fuel impact on thermodynamic processes as well as efficient and ecological indicators. Training laboratory of internal combustion engines. Activities carried out in this laboratory encompass ICE laboratory work, experimental research with different fuels, fuel mixtures, as well as research on various additives used in ICE. Experimental research are carried out by the means of Eddy current load stand AUTOMEX AMX 200 with a petrol engine, fully programmable engine control unit with a modern control system of the stand. 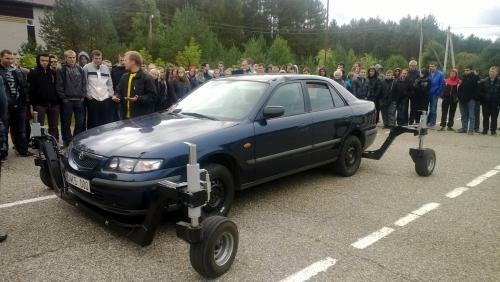 Training laboratory of Automotive Exploitation uses vehicle traction stand MAHA LPS 3000 which allows to determine vehicle traction chartacteristics. Scientific-Research activities in Department of Automotive Engineering (DAE) are tightly related to assessing and solving of traffic safety issues. The observation and analysis of Road Traffic situation and circumstances allow to distinguish the traffic system driver – vehicle – road – environment. The purpose of this chain system analysis is the contribution to overall improvement of traffic safety. Research carried out in Road Users Laboratory of Psychophysiology are related to complex reactions of drivers and all members of the traffic, visibility at the dusk, glaring, peripheral vision, distance, speed perception and other properties. Research on Reliability of Road Vehicles at DAE can be defined as a complex measure of vehicle technical condition, which encompass the no-failure, durability, reparability and maintenance. Research on reliability are based on examination of modern electronic vehicles by applying contemporary diagnostic measures. In assessing the reliability of the vehicle, not only do the failures are detected, but also diverse operational characteristics; there is also a possibility to perform system examination and activate it at the time required. Technical examination of all electric vehicle systems can be conducted at DAT – from the vehicle power supply system to the active and passive safety systems. Accurate evaluation of Automobile Dynamic Characteristics and Driver Qualities enables to determine the horizon of traffic accidents, as well as vehicle stability and manageability properties under difficult traffic conditions and performing dangerous maneuvers. The coordination of Research on Dynamic Characteristics and Vehicle Safety Systems allows to highlight possible areas of improvement. Traffic Safety Laboratory. The Skidcar system used in this Laboratory allows to simulate diverse conditions of Road Adhesion. Simulation of Vehicle Sliding is an important step in analysing complex behaviour of the driver and the vehicle. The only one system of such type and purpose in the country allows to conduct a wide range of research on automobile dynamic characteristics, Braking Efficiency and Tyre Adhesion Evaluation. Modern Equipment in Traffic Safety Laboratory determine the nature movement of sprung and unsprung mases that generalized vehicle loads. 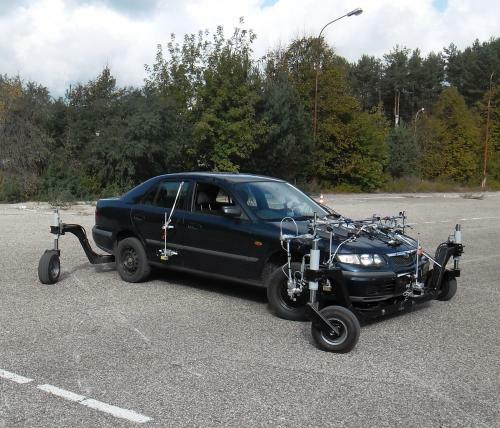 Determination of sliding and fluctuation characterististics enables researchers and scientists of the Department to conduct research on vehicle dynamics under different driving modes simulating driver‘s errors or diverse operations of the vehicle. 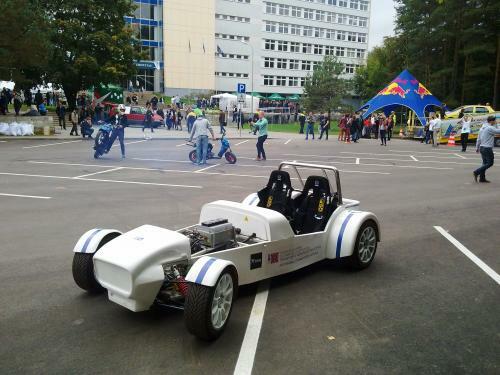 VGTU Electric Car – is an idea of Department of Automotive Engineering (DAE) students that turned into reality. This Project started from an idea to test and implement theoretical knowledge, as well as it reflects the authors‘ aspiration to represent their school of higher education, possibilities and ideas being developed here. Electric Car symbolizes the growing interest of our study programme devoted to alternative energy and well demonstrates how to become a successful example in solving ecological problems in the transport sector. The Concept of Green Electric Car – is entirely electric-powered vehicle that accumulates its power in rechargeable batteries. The students and lecturers of DAE have proven that it is thus possible not only to design, but also to manufacture alternative-fuel-powered vehicle. Due to familiar, reliable design, Lotus Caterham Super 7 prototype has been selected for manufacture of Electric Car. This prototipe is beneficial for its ability to arrange it with the equipment of alternative sources. 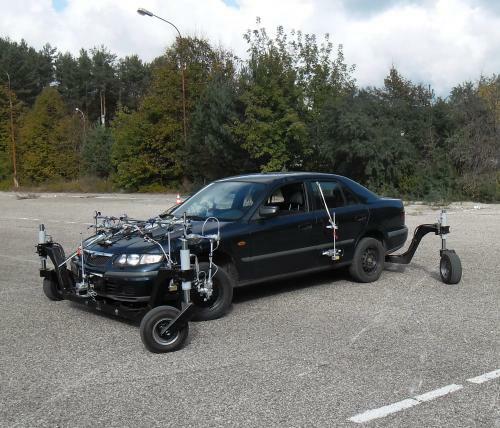 Skidcar system – is a system simulating the slide of the vehicle, operating under the following conditions: the skidcar system operates whilst the vehicle adhesion system is mounted on the vehicle. Upon using the skidcar system, the wheel friction characteristics are changed by changing the vertical load of the tires. In this way, a simulation of driving under different road surface conditions is achieved. This equipment is a major step towards research on complex driver and vehicle behavior (under different simulations of road surface properties). The only one system of such type and purpose in the country allows to conduct a wide range of research on automobile dynamic characteristics, braking efficiency and tyre adhesion evaluation. The system consists of a frame with additional supporting wheels and an active hydraulic (hydraulic cylinders and hydraulic pump) system, which is managed by the means of the control panel located in the cabin. The essential advantage of this system over the passive control devices is an active, real-time, vehile lifting-lowering system. Skidcar system is also beneficial for it enables to investigate and evaluate the properties of the driver and the driving. This device provides opportunities to analyze driving features and driver’s reaction while simulating extreme driving conditions. This might become an effective way to educate driver‘s behavior and improve driving skills upon losing adhesion. Researchers of Department of Automotive Engineering (DAE) participate in a joint project of JSC „SG dujos Auto“ and research fellows from VGTU and Lithuanian Energy Institute - Hydromethane Research and Technological Development. It is aspired to develop an entirely new type of fuel – hydromethane in the first in Lithuanian and the Baltic States Laboratory of the Experimental Research of Hydrogen as Fuel or an Additive to Fuel, Eco-friendly Fuel Additives and Fuel Systems. By the means of advanced technologies, a hydrogen insertion into natural gas is conducted and these gas mixture application in vehicles is thus examined. Researchers of DAE conduct relevant research on innovative hydromethane products and perform hydromethane experimental technology development. It is aspired to develop practical models of hydrogen insertion into natural gas, which, upon preparation of methodology of adaptation to vehicles, would be installed and applied in public, special transport in Lithuania and foreign countries developing an infrastructe designed for natural gas vehicles. With this Project, DAE in collaboration with its partners seek to contribute to development and practical application of advanced technologies in Lithuania. Department of Automotive Engineering (DAE) currently implements the project of national integrated programme „Innovative Research Methods, Solutions, Development and Application in Transport Structures, Means of Transport and their Flows“. Implementation of this project comprises the conduction of theoretical and experimental research, experimental methodology creation and improvement of alternative fuels, experimental data sampling and analysis, efficiency assesment of the suggested alternative fuels, preparation of scientific papers and reports. National Integrated Project facilitates distribution and preparation of recommendations of research results among business entities.